I tried to read Great Expectations, but truth be told I found it exceptionally boring (and this from someone who loves Charles Dickens). My friend Fidel Gomez, Jr. (who may or may not be dead) suggested I read Great Expectations a chapter a day rather than reading continuously, since it reads better as a series of adventures rather than a straight book. I do know enough of the plot to plunge into the first adaptation of Great Expectations. David Lean created a brilliant adaptation, mixing the moody visuals with a story that keeps one interested (albeit moving a bit slowly for my tastes). In voice-over, Pip (John Mills) narrates our tale. He starts out as a young orphan, taken in by his unpleasant sister named "Mrs. Joe" (Freda Jackson) and her kindly blacksmith husband (Bernard Miles). While going to visit his parent's graves, Pip is accosted by an escaped criminal, demanding food and drink and threatening to have his fellow escapee kill Pip and his family. A terrified Pip does as he's told, going so far as to steal the bullying Mrs. Joe's pork pie. Before he is discovered though, the criminals are caught, and the one that bullied him, Magwitch (Finlay Currie) takes the fall for the pie. Some time later, the wealthy but reclusive Miss Havisham (Martita Hunt) requests Pip come visit her and her ward, Estella (Jean Simmons). Miss Havisham is a truly bizarre figure: jilted on her wedding day, she continues to wear the bridal gown she had on before news of her runaway groom came to her, the wedding feast still laid out, with only the rats to delight in the mummified cake. She wants a playmate for Estella, but in really she is training her to take revenge on all men by having them fall in love with her only for Estella to later reject them. Pip does indeed fall in love with Estella, though she is terribly cold with him. More time passes in this odd game, and Pip discovers that he has a mysterious benefactor, one who wishes 'great expectations' for him. He now abandons his apprenticeship with Joe and goes to London to become a gentleman, where the benefactor's lawyer Mr. Jaggers (Francis L. Sullivan) and his selected roommate Herbert Pocket (Alec Guinness) will handle his finances and show him how to be a gentleman. As is the case in life, mo' money mo' problems. Estella (Valerie Hobson) has indeed grown beautiful and cold, turning from Pip to the dull Bentley Drummle (Torin Thatcher) whom she cares nothing for. All this time Pip suspects that the mysterious benefactor is Miss Havisham, but we find that it is Magwitch himself, grateful for Pip's kindness and never having forgotten it. Magwitch has made a fortune in Australia, but returning to Britain puts him in danger of getting locked up again. Jaggers, ever loyal to the employer his shrewd legal mind won't recognize, tells Pip, "Take nothing on its looks; everything on evidence. There is not better rule." Why did he think Miss Havisham was his benefactress? Why was Estella so cold? What of Estella's parentage...how is Magwitch related to that question? Pip, having met his 'great expectations' and found them lacking, confronts the cold Miss Havisham and colder Estella. Havisham, having seen the extent that her vengeance has wrecked so many lives, attempts to call Pip back, but her gown catches fire and she is killed. The truth comes out at last: Magwitch is caught attempting to escape with Pip and Pocket's help but is killed in the process, and when Drummle discovers Estella's true past he abandons her. Estella appears to be repeating the mistakes of her patroness, but Pip forces the window curtains open, and now perhaps Pip and Estella can enter the world with hope. Great Expectation has all those Dickensian coincidences that I have come to see are Chuck's modus operandi. What ARE the odds that Magwitch (the criminal Pip meets) would be Estella's father (who was taken in by Miss Havisham, who knows of Pip)? What ARE the odds that Mr. Jaggers would be the lawyer to BOTH Miss Havisham AND Magwitch (thus giving the impression of who was helping Pip)? In Charles Dickens' novels I find that coincidence plays a major role: the relationship between the Evremondes and the Mannettes in A Tale of Two Cities, Oliver Twist being the long-lost nephew of the family that rescued him. Great Expectations does not stray from these aspects (though again, never having gotten through the novel I cannot say how close it is to the original). However, Lean creates this creepy, moody world where Pip finds himself going from the gentleness and sincerity of Joe's lower-class to the rarified world of wealth only to find that money cannot bring happiness. Think of those characters that have money: Miss Havisham and her greedy relatives waiting for her to die, Magwitch running from the law. They are not happy at all, and Pip learns that those 'great expectations' are fraught with falsehoods. Among Great Expectations brilliant moments come from the visuals. The spooky moor and graveyard, the decayed opulence of Havisham's heartless mansion, the genteel squalor of Pip and Pocket's digs: they themselves tell us as much of the story and characters as the spoken dialogue. If anything, Great Expectations is a beautiful film visually. In terms of performances there is some extraordinary acting in the film. Hunt's Miss Havisham is a cold, cruel being who by the end finds that she has been wrong. While we don't actually see her burn (and she certainly deserves to burn) we do feel empathy for her. Simmons, only a child at the time, is brilliant as the cold and heartless Estella. In a smaller role, Jackson's Mrs. Joe inspires total hatred for how mean and bullying she is. However, we can't leave out Mills' Pip, who goes from a gentleman to a man, as well as Guinness' light turn as the comic Pocket, eager to help in any way he can. 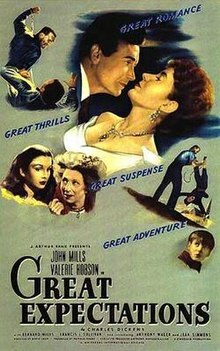 If I were to find any faults in Great Expectations, is that it feels terribly long (and this is after Lean, along with Ronald Neame, Anthony Havelock-Allan, as well as Kay Walsh and Cecil McGivern, streamlined the novel). It just felt as if the film is so long that it starts to drag. However, this is a minor complaint. Great Expectations is a strong adaptation of a book I found a bit dull. Minus the sometimes slow movement I found it to be well-made, well-acted, and well worth the time, particularly if you love the book.